I base these instructions on an art book written by Pauline Cherrett. 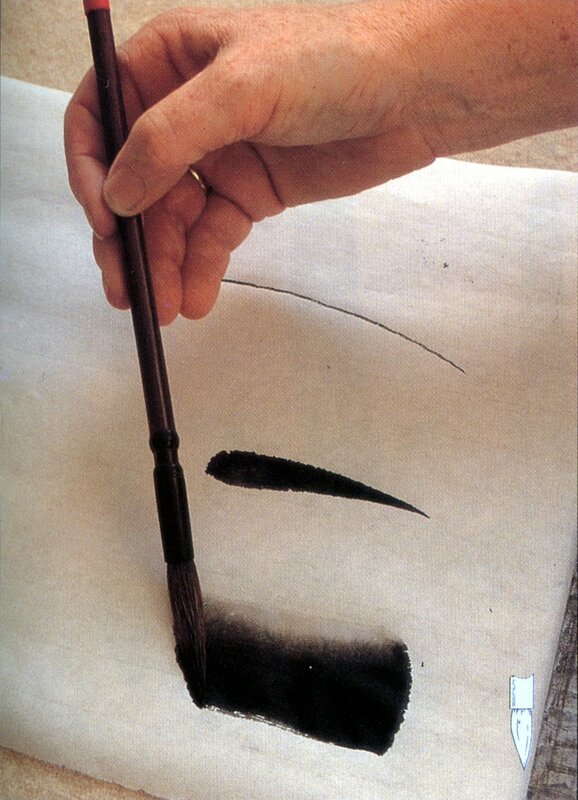 Chinese brush painting is nothing like how Western inkers handle there brushes. Western inking artists pull their brushes mostly towards them –with some sideway movement for expediency– by resting their elbows on a table (and even more of the lower arm, up to the outside of the hand to have more control). It could be called “control by restriction”. Chinese brush painting, on the other hand, is much more based on movement. How you hold your brush and how much force you apply on the brush, and how that force varies during the movement is suddenly very important. You want to restrict your hand as little as possible, but instead use your shoulder joint and wrist to guide the brush, fast and precise. 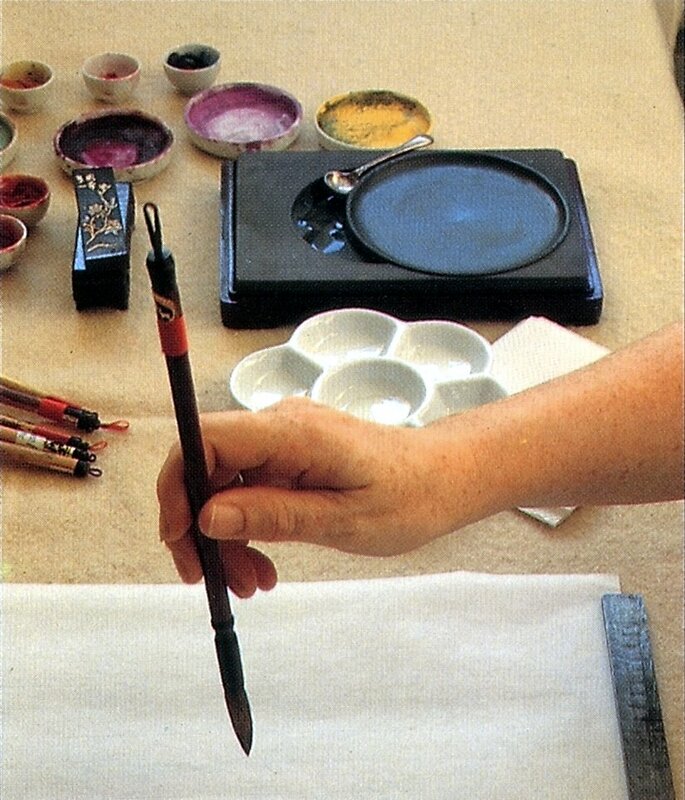 The idea is that you “float” with your brush over the paper in any direction you see fit. You may support the wrist of your hand (e.g. with your other hand), but in no case should you restrict the movement of your brushing hand by supporting the side of that hand. I like to see as follows: artists tend to ink like they are used to write. 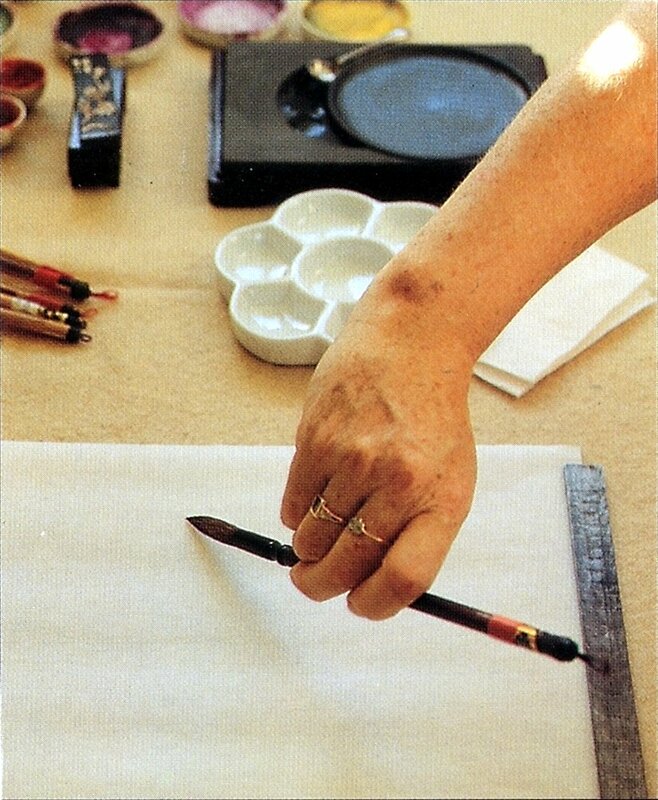 Now for some detailed description how to hold the brush for Chinese brush painting. Grab hold of the brush as you would a an eating stick. Put the brush between your middle and ring finger, with the handle against your ring finger’s nail. Support that finger with the little finger, and use the index finger to support the middle finger. Put the point of your thumb on the handle. Between the handle and the palm of your hand there should be enough room for an egg. Don’t hold the handle too tight and start by holding the handle at the halfway point. You’ll gradually get used to this grip. For firm strokes, keep your brush upright. For soft petals use a slanted position. You should be able to stroke the brush in both vertical and horizontal direction. 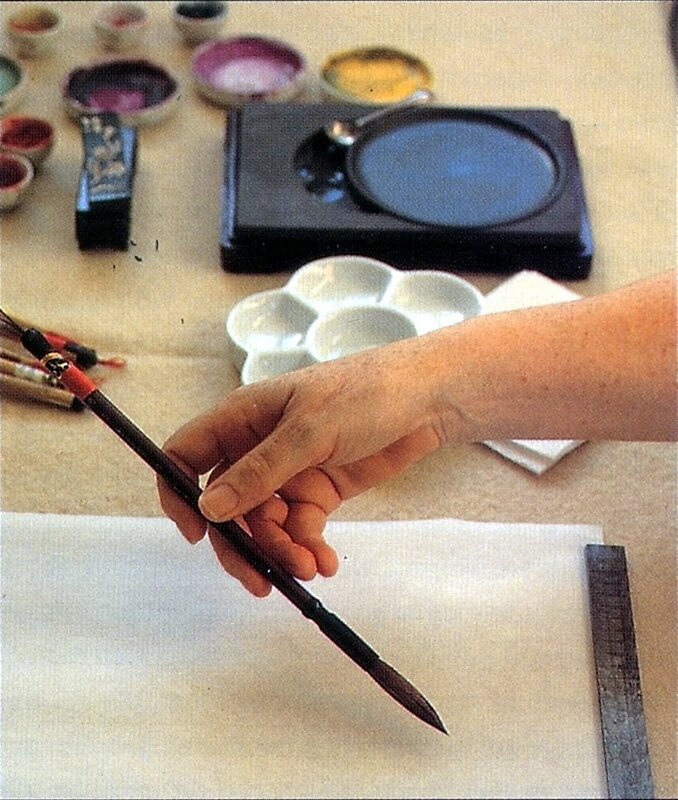 The wrist and grip on the brush should be flexible enough to make a circular movement. 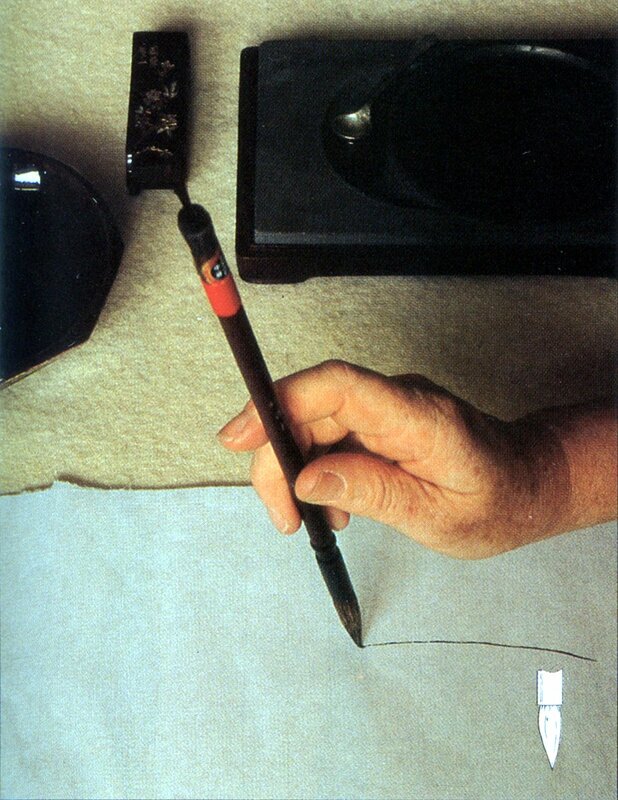 To be able to move the brush in any direction, the arm should not rest on the table. For a successful painting, it is essential to hold the brush in a proper manner. 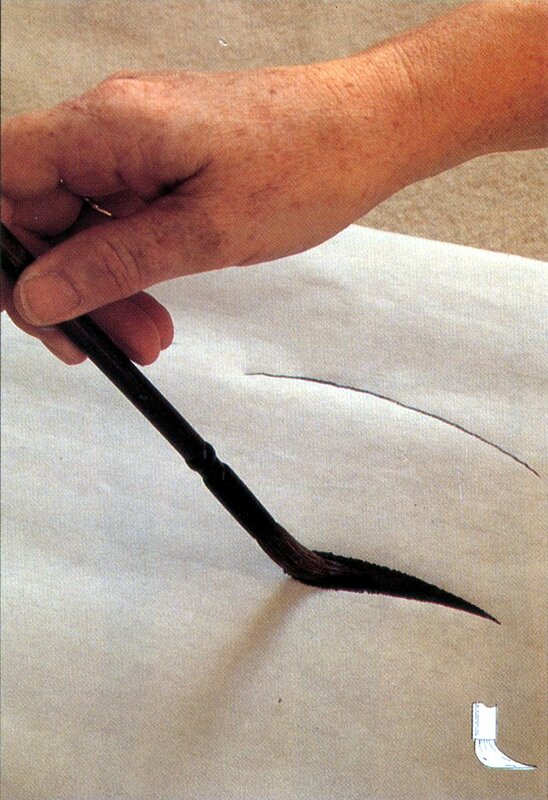 For thin lines, keep the brush vertical like an eating stick, and apply little pressure. By moving the brush while increasing pressure, you start with a thin line that gradually gets wider. How fast that happens depends on the applied pressure. Use the side of the brush for broad strokes. You could use the entire length of the brush, but it is best to keep part of the brush as “reserve”. Awesome tips, Rene! I really appreciate you sharing this on my behalf. I’m so curious now. As a complete painting beginner, this is gold to me. I’ll share what I find out from my experience. Thanks a million!